For more than seventy-five years, municipal, regional and provincial authorities have sought to protect the valley’s natural open space from urban development and provide a park system suitable for a metropolitan area. 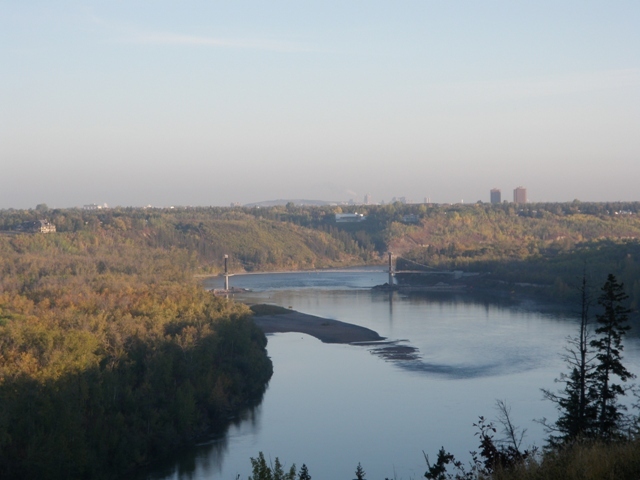 Edmonton’s River Valley is considered its greatest asset. The City of Edmonton wants to highlight the River Valley with new structures that make a signature design statement, have the least environmental impacts and are built to last. Patricia Ravine Trails and Wolf Willow Ravine Bridge components are complete. Construction of the Fort Edmonton Footbridge and Trails began in August 2008. If you require parking closer to the footbridge you can access a small parking and turnaround area located at the end of Whitemud Road NW. 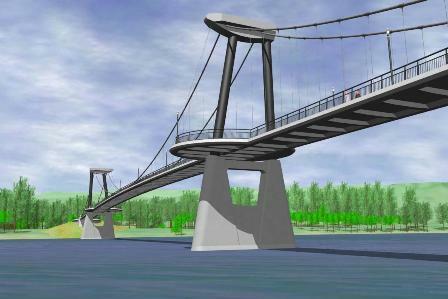 Edmonton City Council approved the Fort Edmonton Footbridge project within the Ribbon of Green Concept (1990) and Ribbon of Green Master Plan (1992) documents. It further supported completion of the River Valley Plan in the Community Services Integrated Services Strategy (2000), the Urban Parks Management Plan (2006), and the Capital Region River Valley Park – Plan of Action (2007) prepared by the River Valley Alliance. Growth in south west and west end communities is anticipated to create demands from an additional 143,000 residents in the next 10 years. This growth is contributing to an increasing demand for access to recreation services and facilities in the river valley park system. Bridge design comments were predominantly supportive. General comments expressing support for the project and congratulating the project team for a job well done. Encouragement to get the project underway and completed as soon as possible. Parking in residential areas is a concern and should be monitored. Stairs and access to the river valley should be improved where possible while still preserving the natural environment. The footbridge crosses the North Saskatchewan River upstream of Fort Edmonton Park and affords a connection between the new multi-use Trans Canada Trail around Fort Edmonton Park and new park land purchased on the west side of the river (Centennial Lands) in 2007. 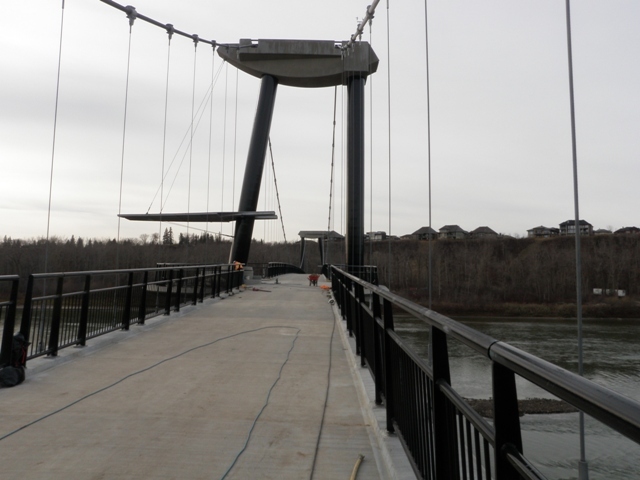 The Fort Edmonton Footbridge will enhance Edmonton's extensive trail system by creating a key link between the north and south sides of the river. Trail connections will be improved to access the footbridge and to connect future trails leading south to the city limits and south through the Capital Region. 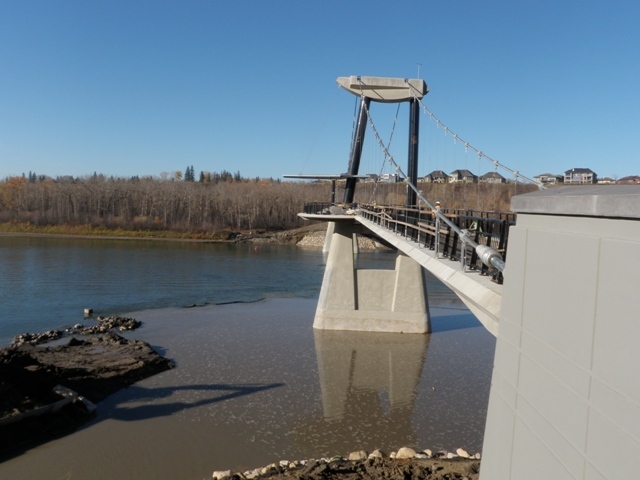 The design of this footbridge was selected to achieve the objective of “better design in a world class city” and is considered reasonable value for a signature facility with “in-river” construction requirements. 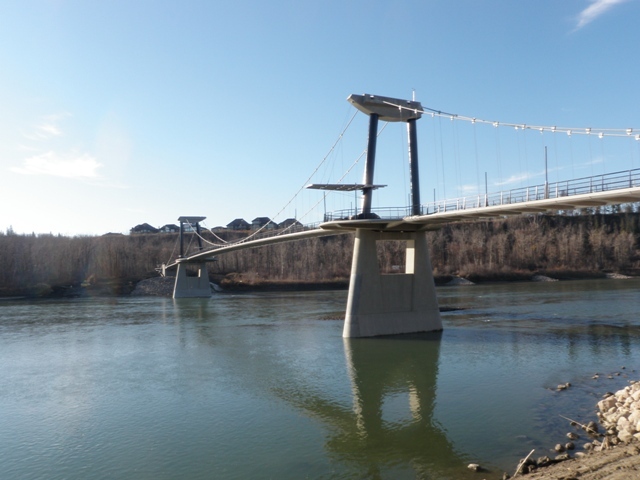 The design selected for the footbridge offers the least amount of environmental disruption within the North Saskatchewan River, both permanently and during construction. 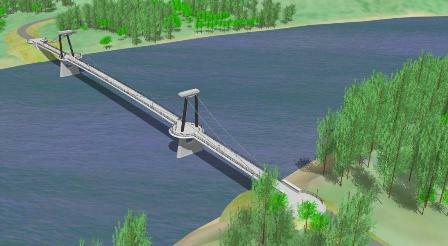 This design was the only one with just two piers in the river, meaning less impact on the river environment. The project helps the City to achieve goals of sustainable transportation and healthy communities by encouraging walking, cycling and non-motorized transportation. The total project cost of $28.2 million includes the overall planning, design, engineering, environmental permitting, public consultation and actual construction of the footbridge, 2.5 km of access trails and stairs, and a secondary bridge crossing at Wolf Willow Ravine. 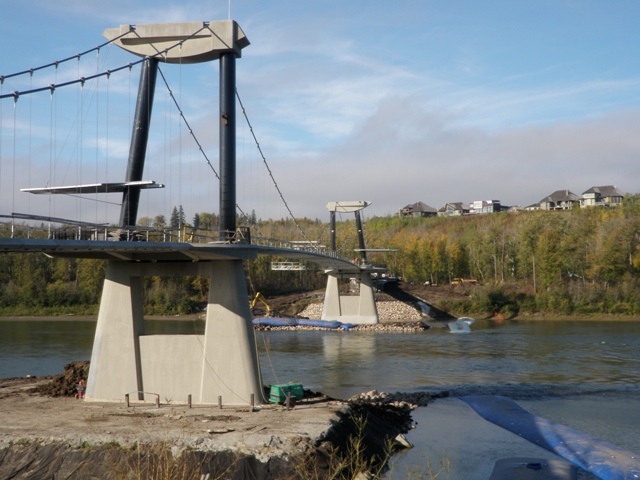 The Fort Edmonton Footbridge is being constructed at the Southwest end of Fort Edmonton Park, over the river to City land below the new Wolf Willow Ridge subdivision. Trail connections will be improved to access the footbridge. The project budget is $28.2 million. Funding for the project was identified in the 2008 City budget.